It seems as if everyone has student loan debt. I graduated with $25,000 in student loans nearly 20 years ago. Much of that debt was from foolish spending and is one of the biggest student loan mistakes you can make. I chat with a lot of individuals about student loans. Student loan debt holds a lot of people back from pursuing other goals. I know it did for me in the five years it took me to pay off the debt. Unfortunately, you can’t go back and fix decisions you made in the past. 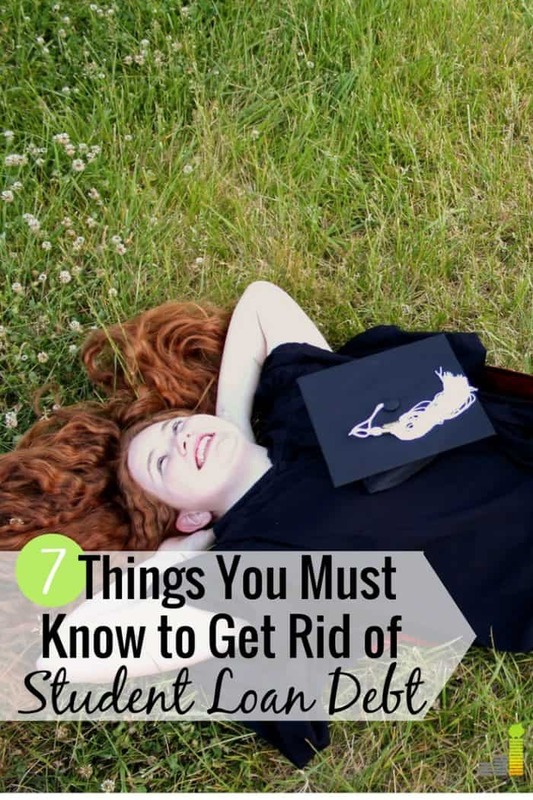 However, you can still fix many of the most common student loan mistakes right now and begin killing that debt for good. Here are seven major student loan mistakes you may be guilty of and what you can do to get yourself on the path to pursuing other goals quicker. Not everyone can get a good-paying job right out of college. Even those who do may not be able to afford making student loan payments right away. Many student loan providers understand this and allow graduates to put payments on deferment, elect forbearance or opt for income-based student loan repayments. This may offer a welcome respite, but over the long-term, it can be a major student loan mistake – especially if you have unsubsidized or private loans. Interest will continue to accrue in that case, only growing your overall student loan balance. Personally, I took three years of deferment, which added several thousand dollars to my overall indebtedness. I was addicted to spending and thought putting off payments would help me. Many make the same mistake, with over 40 percent of individuals not making payments – as of 2016. There may very well be a need to take the deferment route, and that’s okay. Just don’t use it as a long-term crutch to avoid paying back your student loans. Refinancing or consolidating your indebtedness is a great way to pay off your student loans faster. 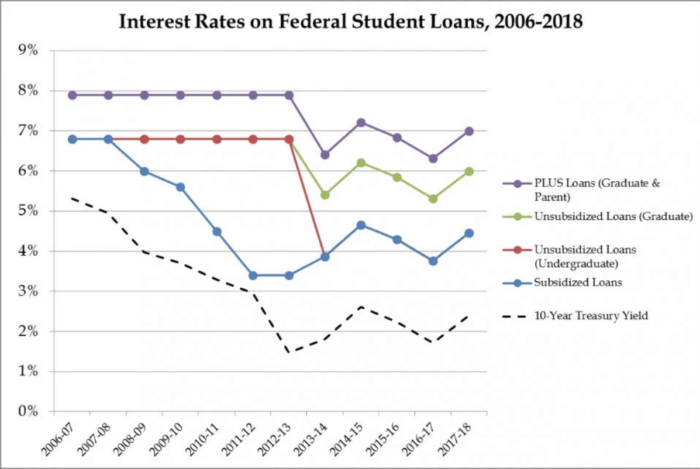 The table below shows the average student loan interest rate for most federal loans. Private loans will often be higher than federal rates. Refinancing often allows you to lower student loan payments, enabling you to become debt free quicker. Check rates at Sofi to see how much money you might be able to save. Credible is another good option to lower your student loan interest rate. Consolidating your student loans, on the other hand, allows you to take multiple monthly payments and roll them into one simple monthly payment. Consolidation won’t necessarily help you save money, but it can be a great way to simplify payments. The other added benefit of consolidating student loans is that you often get to keep the protections offered by federal loans. Remember those protections I just mentioned? There are certain cases where refinancing your student loans can actually hurt you and turn into a big student loan mistake. You may have access to other benefits through your federal loans, so it pays to research those before refinancing. When you refinance into a private loan (refinancing is not available on the federal level) you often forfeit many of those benefits and protections. Some private lenders will offer some of these protections, but it’s by no means a guarantee. Again, refinancing can be a great way to save money on your student loans – especially if you have private loans. Life gets busy. It’s easy to forget to do certain things, even something like paying bills. I know I’ve forgotten to pay a bill before because something came up, or I just plain forget. Missing student loan payments can affect you later in life by negatively impacting your credit and costing you more money. Most student loan lenders make automating payments very simple, plus they lower your rate so it only makes sense to take advantage. What do you do with leftover money from student loans? One of my favorite things to do was to take my student loan refund check and spend it on something completely unrelated to my education. I’d spend it on a night of drinks, take a vacation or just get something I wanted to buy at the store. This is one of the worst student loan mistakes to make because it only adds unnecessary debt and does nothing to further your education. The best thing to do with that student loan refund check is to use it for something you need for college, such as books or a computer. You can even use the refund check to start repaying your student loans while in college. Whatever it is, make sure it helps you in the long-term and not needlessly adding to your indebtedness. Life and disability insurance seems contradictory to student loans. In fact, they often make a perfect marriage. Remember that federal loans offer certain protections? Having loans forgiven upon your passing is one of those protections. Federal loans are often discharged upon death, as are PLUS loans. Many private loans do not offer the same protections, meaning your parents or spouse can be on the hook to repay them if you die. Co-signers and spouses in community property states are also at risk of needing to repay your student loans. Getting cheap term life insurance is a great way to protect your loved ones if you have private student loans. If you experience an untimely passing, they can use the tax-free insurance proceeds from your term life insurance policy to repay the loans. Check rates at PolicyGenius to find a good policy to protect your family. Disability insurance accomplishes something similar. Private loans often don’t provide protection if you become disabled. However, disability insurance can help protect against loss of income and allow you to continue to make payments. I commonly hear that it makes sense to continue making the mistakes you made when taking out student loans. I know I felt this way when I had a lot of student loan debt. Let’s face it. Many of us make mistakes when taking out student loans. That doesn’t mean you need or should continue making similar, or new mistakes! It’s easy to think that you’re a victim and simply continue down the same path. A victim mentality will do nothing to get you out of debt. It often only furthers the situation, making it more difficult to pay off the student loans. I know it can be difficult to get motivated to pay off student loans. Don’t let that hold you back. Instead, focus on what life will be like once you’re free of the student loans. Student loan debt can be overwhelming. The average student loan indebtedness for the class of 2017 was just over $37,000. That is a lot of money! It may feel like “everyone” has student loan debt. It may even seem like student loan debt is “good” debt because it made your education possible, or you have a low-interest rate. Don’t give into those thoughts. Student loan debt is still debt. Debt holds you back from pursuing your goals and enslaves you to someone else. There are many ways to save money when paying off student loans. There are multiple options for paying off student loan debt faster. Find what helps you the most and attack the debt. Before you know it, you’ll be free of student loans and pursuing important goals. What are some of the biggest student loan mistakes you made after graduating? How much student loan debt did you have to repay? Why do you think many view student loans as “good” debt? The post 7 Biggest Student Loan Mistakes That Cost You Huge Money appeared first on Frugal Rules.